This is a very special festive treat. 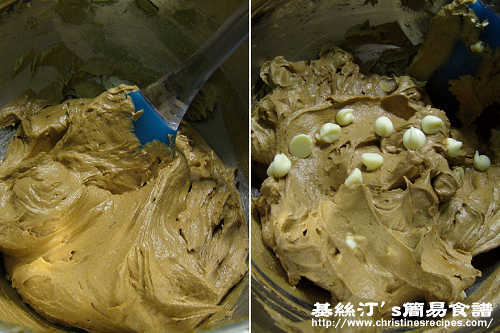 To make chocolate cookies, coco powder are commonly used to give an attractive look and brownish color. Here I made a little tweak of using brown sugar to replace the coco powder. The flavor of white chocolate blends with the aroma of brown sugar so well. I made two dozens of these special cookies just in case of any friends of mine dropping by during Christmas holidays. In a large bowl, cream the butter, brown sugar and white sugar until smooth. Add whisked egg, and stir in milk and vanilla extract. Sifted together the flour, baking soda and salt, and add to the sugar mixture a bit at a time until all ingredients well blended. Fold in white chocolate chips. Let chill for 30 minutes in the fridge. Line a baking paper on a baking pan and place rounded tablespoons down on the baking paper, each cookie at least 3 inches apart. Bake for 10 to 12 minutes in the preheated oven for chewy cookie or 14 minutes for a crunchy and firmer cookie. Let cool for 1 to 2 minute(s), then transfer to a wire rack to cool completely. Store in tightly sealed container. how did you make them into that shape ? I used a cookie cutter to make that shape. 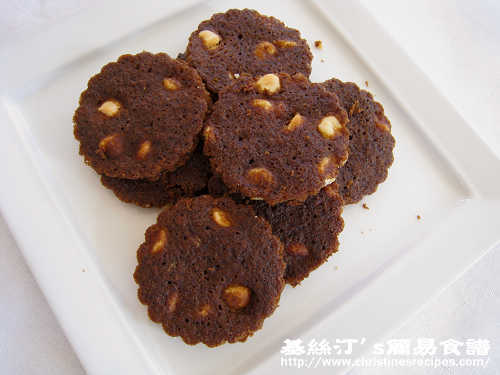 Hi Christine, i just made a batch of these cookies and only after i baked them then i clicked on your brown sugar link and realised its 黑糖 :). Wanna make them again but not sure if i have the right 黑糖. In Singapore i see different kinds of brown sugar so now a bit confused. Would appreciate your advice. Thanks. You're right. There are different brands of brown sugar. Quite confusing. The good news is that you can use any brands of brown sugar to bake these cookies. The brown sugar is to help add a darker colour and sugar cane flavour.